Each baby shower measuring spoons set measures 5.25" x 2.25". Set of four heart-shaped measuring spoons, wonderfully crafted in durable stainless steel - each an accurate measure of either a tablespoon, teaspoon,.5 teaspoon or .25 teaspoon. Each is engraved on its handle with a loving-notion-inspired saying of: "A pinch of joy", "A dash of tenderness", "A spoonful of affection" or "A heap of love". Delightfully packaged in a clear acetate topped box with a white base and interior with a unisex pastel colored design featuring baby buttons, teddy bears, baby bottles and more. Box, wrapped and tied with a white organza ribbon and an attached "For You" tag with a matching button themed design. Sample price of $1.86 is limited to one per customer and cannot be purchased with additional quantities of this item. Limit of 1 sample, in total, per order. 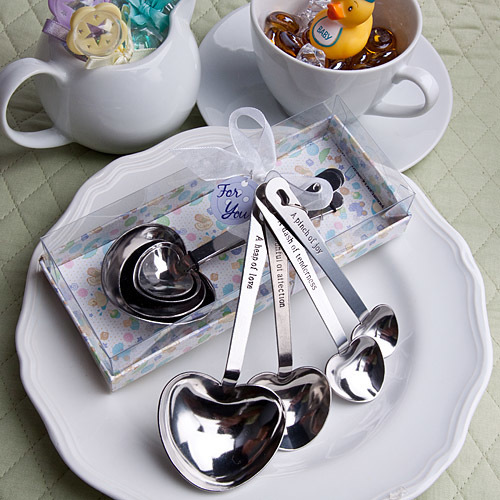 Please allow 4 business days to fulfill your order of baby shower measuring spoon favors; then add ship time from NY.